Women should be able to travel wherever they want. Every single country in the world should be safe for women. Unfortunately, that is not the case. No matter how hard we try, some places, which don’t have a great track record, are best avoided by female travellers. However, we are bringing a happy twist to this fact. Here are six beautiful places in the world which are considered the safest countries for women. This information has been curated through personal experiences of Indian women who have travelled to these countries alone or with a group of women. Any amount of time spent in Japan will feel inadequate. This country is so vast and so diverse that you can’t possibly see it all in one trip. Apart from the beautiful scenery, Japan has a super efficient public transportation system which can be used even as late as 1am. The people are helpful and generally keep to themselves unless you strike up a conversation. Bars are safe for women to visit too. Inter-city travel is quite easy too with bullet trains connecting several cities to Tokyo. Must-do: Spend a day in Kawaguchiko where you get the best view of Mt Fuji, party in Tokyo, stroll through the Fushimi-Inari shrine, and watch the annual Miyako Odori in Kyoto. Best time to visit: Spring, when you can see the cherry blossoms in full bloom all over Tokyo. Like every country in the world, Sweden has its ups and downs when it comes to women’s safety. But it is still considered one of the safest places for women in the world. Swedish men and women are treated equal in most spheres of life including daily interactions. This country is absolutely stunning and boasts of some of the best cultural experiences in Europe. If you’re visiting Sweden, you can also head to Iceland which is about 3 hours away by flight. Like Sweden, Iceland too is considered to be one of the safest countries in the world for women. Must-do: Explore Stockholm, visit the palace, and the city’s plethora of museums, try an original Swedish cinnamon roll in Stortoget, visit the lakeside sauna at Hellasgården, see the Northern lights. Best time to visit: December to February, if you want to see the Northern Lights clearly. 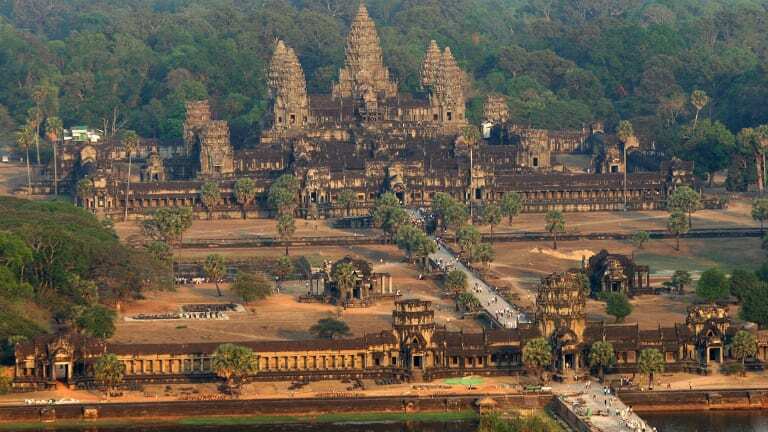 If you enjoy tropical weather and strolling through history, Cambodia is the place for you. Through ancient ruins, temples, and cruises, you can discover one of the most beautiful countries in Asia. Cambodia is considered quite safe for women and most first-hand reports say that the locals are generally friendly and respectful. However, the normal precautionary measures do apply. For example, don’t leave your bags unattended and don’t do or wear anything that makes you look loaded with money. Must-do: Explore Siem Reap on a cycle, go on a cruise in Mekong to spot dolphins, spare a day for Angkor Wat, and visit the famous ‘Tomb Raider’ temple. This is another country that cannot be covered in one trip. The landscapes of Canada are so vast and the cities so vibrant that you will need to make a few trips here to see most of it. Canada is considered one of the safest countries for women. Female tourists can travel the country freely, whether in cities or the less crowded places. But some precaution should be exercised if you’re alone at night or in an isolated area. For your own peace of mind, avoid travelling on isolated stretches at night and keep someone informed of your whereabouts. Must-do: Visit Niagara Falls, go on the EdgeWalk in CN Tower in Toronto, go mountain biking in Vancouver, and spend a few hours admiring the Canadian Rockies in Banff National Park. Best time to visit: Summer months, depending on which part of Canada you’re visiting. Known for its vibrant capital, Amsterdam, The Netherlands is a gorgeous country. It’s perfect for a trip with friends since there’s so much to do and see. Apart from Amsterdam, you can also visit The Hague and Rotterdam among other cities. This country is best explored on foot or on a bike. Don’t miss the beautiful tulips dotting the gardens of Amsterdam. Must-do: Take a boat tour in the canals of Amsterdam, visit Anne Frank Museum for a surreal, historic experience, and stroll through the Garden of Europe which is the largest public garden in the world. Best time to visit: Mid-March to early May for tulip season. For tourist-friendly weather, mid-April to October is ideal. Violent crime is rare in this beautiful country so it’s considered safe for all tourists. According to first-hand accounts of female travellers, Madrid and Barcelona are safe and not scary at night for women to be out in a group or alone. Of course, being tourists, you do need to be careful of petty theft. Make sure your bags are secure and try to travel light to avoid looking hassled. Must-do: Visit Alhambra for a taste of royalty, party in Ibiza, and chill on the beaches of Mallorca. Best time to visit: April-June, September-October, if you want to enjoy the sun and moderate temperatures. Ready to go on a trip with your girls? Refer to this list and get ready for an epic vacation.